The following is directly taken from the IndyCar Media website. Reigning Indianapolis 500 winner Tony Kanaan has been immersed in the Indianapolis Motor Speedway road course reconfiguration project since its inception seven months ago, and even maintains a Downtown Indianapolis apartment for his frequent visits. But ahead of the Verizon IndyCar Series Open Test on April 30, he took up residence in the motorcoach lot inside the grand stadium in preparation for the inaugural Grand Prix of Indianapolis on May 8-10 and the 98th Indianapolis 500 Mile Race on May 25. “The good and bad part about sleeping at the track is that (Indianapolis Motor Speedway President) Doug (Boles) can call me at any time. Obviously, this place has always been very special to me, and I wanted to make sure I woke up May 1 inside the track,” Kanaan said in providing a brief debrief May 1 of the test on the 2.439-mile, 14-turn circuit. Multiple drivers, team personnel and manufacturer representatives have had input in the $5 million project, which is part of the initial phase of a long-term infrastructure improvements and enhancements to the facility opened in 1909. “I raced here in Grand-Am, and that was fun, but that track was very slippery,” said KVSH Racing’s Sebastien Bourdais, who co-drove to victory in the 2012 sports car race on the former road course. “I have to say I had some reservations early on because the corners (of the new racetrack) are very tight, but the grip more than makes up for it. The new asphalt that was laid down is very, very grippy and actually a lot of fun. I don’t think anyone will have much to say about it. 2. 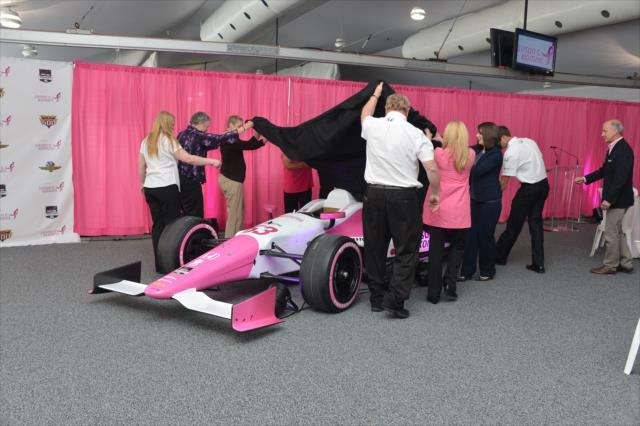 Mann’s Indy 500 ride to support Susan G. Komen: A cause-oriented idea sparked a promotional proposal mushroomed into a pink platform for Pippa Mann and the Susan G. Komen, the world’s leading breast cancer organization, for the Indianapolis 500 Mile Race on May 25. Mann will drive the pink and white Honda-powered No. 63 Dale Coyne Racing car in the 500 Mile Race, the British driver and Komen principals announced at the Indianapolis Motor Speedway, in a campaign to help raise funds and awareness throughout the month. The genesis of the Month of May program was Mann’s inclination of altering the primary color on her helmet to support breast cancer awareness. A pledge site – www.racewithpippa.com — will be available through May 25. Practice begins May 11, with qualifications May 17-18. Brandon Fry, who was Mann’s race engineer when she made her Indy 500 debut in 2011 with Conquest Racing, returns to oversee the program on the 2.5-mile oval. He’ll be joined by much of the crew from Muscle Milk Pickett Racing, which in mid-April withdrew from sports car competition. “(2011) was a big year for me with one day of testing before we turned up,” Mann said. “The driver-engineer relationship is an important part in having a successful program. This will be my first time coming into the Indianapolis 500 that I’m not trying to learn a new car and new engineer.